"The Last Story Of David Allen"
An ordinary man, forced into killing, tells the story of his last victim, and the girl he tried not to fall in love with. A Union Soldier goes to war to free slaves but finds that he is freed by them. In theaters worldwide April 22, 2016. In Theaters April 22, 2016. Cassidy Way is a gut-wrenching and bloody thriller inspired by true events. When film students Gina, Collin, and Mitch set out to make her thesis documentary film about water contamination caused by a fracking company in Kern County, they decide to trespass at an old fracking site and uncover documents relating to the company, it’s dark past and the subsequent cover-up. After narrowly escaping capture by the Saxlow company guards the trio encounters local teen Jamison Connors, who takes them back to his house where they meet his sister, mother, and his father Donald. Donald, a man obsessed, suspects the three of being involved with the fracking company and proceeds to exact his twisted revenge on the students as a way of avenging his youngest son’s death which was caused by Saxlow guards a decade prior. Worldwide Release February 23rd 2016. A RED THREAD PICTURES film. Set in a college classroom, where Professor Pavlic lectures on the origin of man and spoken language, four students confront each other and act out their traumatic life experiences before the rest of the class. The professor keeps receiving anonymous love letters from someone. When she discovers that the love letters are being sent to her by a lesbian student in her class, the outcome leads to a moving and stunningly dramatic conclusion. "The Making Of Cassidy Way"
A Documentary that takes you beyond the studio walls of filming and behind the scene of Cassidy Way the movie. 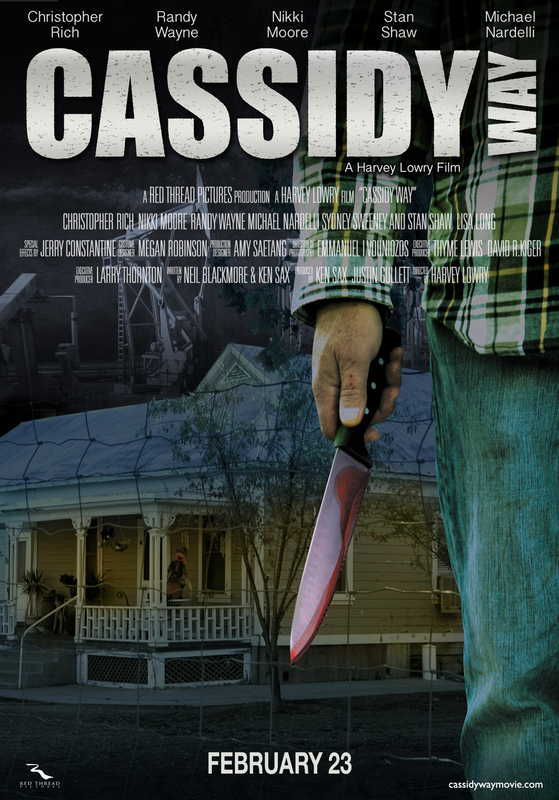 "Cassidy Way" a gut-wrenching and bloody thriller inspired by true events. When film students Gina, Collin, and Mitch set out to make her thesis documentary film about water contamination caused by a fracking company in Kern County, they decide to trespass at an old fracking site and uncover documents relating to the company, it’s dark past and the subsequent cover-up.